Embattled Egyptian President Hosni Mubarak is likely to step down immediately and turn over power to a transitional government headed by Vice President Omar Suleiman, backed by the army. A deal to this effect is being brokered by the Obama administration, which is in talks with top Egyptian leaders, New York Times reported on Friday quoting US officials. Officials said under the proposal, the transitional government headed by Suleiman would prepare constitutional reform to prepare the country for a free and fair election in September. US officials, the paper said, expect the protest in Egypt to grow in size and intensity on Friday and the administration fears that it may spread to engulf the entire Arab world, including some of its closest allies in the region. 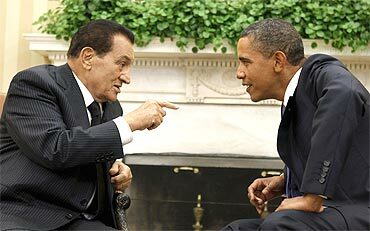 Notwithstanding denials by Mubarak himself that he does not propose to quit, the NYT said, the Obama administration was in advance talks with top Egyptian leaders about the possible immediate resignation of the embattled President. 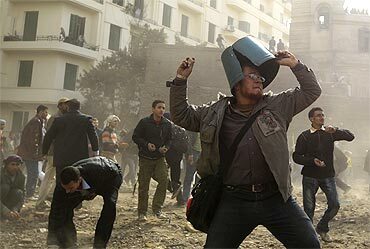 Washington feels that the best solution to check protest disintegrating into widespread violence was to take tangible steps to address the protesters' main demand that Mubarak leave office. "Creation of a military backed caretaker government in Egypt is one of the several proposals being discussed between officials of the two governments," the paper said. 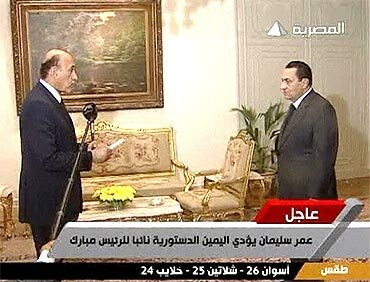 Under the plan, Vice President Suleiman backed by Chief of Egyptian armed forces Lt Gen Sami Enan and Field Marshall Mohamed Tantawi, the Defence Minister would immediately begin a process of constitutional reform. The proposal also calls for the transitional government to open dialogue with members from a broad range of opposition groups, including the banned Muslim Brotherhood, to open up the country's electoral system to hold free and fair election in September, the paper quoted officials as saying. Mubarak, the NYT said, had balked, so far, at leaving and there was not yet any indication that either Suleiman or the Egyptian military was willing to abandon the president. The reports of immediate change over in Egypt came as top US officials including Vice President Joe Biden and Secretary of State Hillary Clinton have opened constant direct contacts with Suleiman. 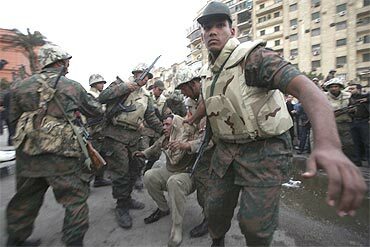 The top US military commander Mike Mullen said that Egyptian army officials have 'reassured' him that they will not fire on protesters. The NYT said questions were being raised about whether American intelligence agencies, after the collapse of the Tunisian government, had adequately warned the White House and the top lawmakers about the prospect of an uprising in Egypt. However, in an interview to ABC news, Mubarak admitted he was "fed up" with being president but he could not step down for fear of sowing chaos in the country. Mubarak's net worth: Rs 319,500 crore!